The mainstream has changed in recent times, with ATI launching several dead-die SKUs (Stock Keeping Units), including the Radeon X800GT and Radeon X800GTO. 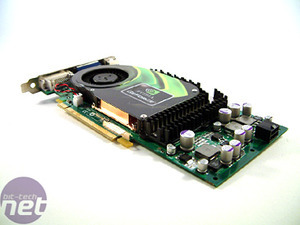 The former was a very capable competitor to the GeForce 6600 GT, while the Radeon X800GTO was left in unchartered waters with no real competition on the market, as the GeForce 6800 Std was not a match for it by any stretch of the imagination. Above that price bracket, there has been the Radeon X800XL and GeForce 6800 GT fighting it out, with both cards being pretty evenly matched across the board. 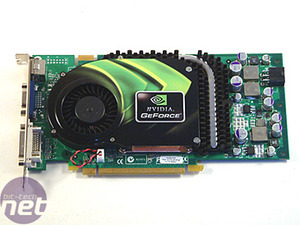 However, many consumers opted for the GeForce 6800 GT because of the additional feature set it had. Since the release of GeForce 7-series, both of these video cards have come down in price a little and they're now retailing for around £190-200. Today, NVIDIA have announced a new video card designed to replace the GeForce 6800 Std. 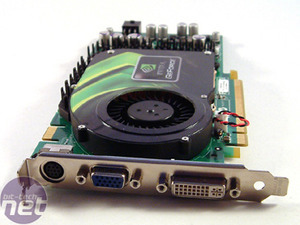 It goes by the name of GeForce 6800 GS, and features the same pipeline layout as GeForce 6800 Std, meaning twelve pixel pipelines and five vertex shaders. The card has a MSRP of around £170 inc VAT, so it is not quite direct competition to the Radeon X800GTO, and not really in direct competition with GeForce 6800 GT and Radeon X800XL either. At least, in terms of price. 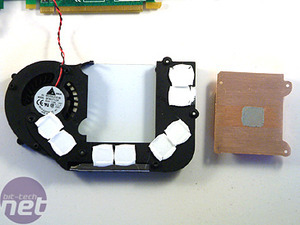 The heatsink looks familiar, and its shape is very similar to the cooler on GeForce 6800 GT. It is a single slot solution using a radial blower fan that spins relatively quietly. The core of the heatsink is made from copper and the memory is cooled with a heatpipe solution. The fan was subjectively louder than the fan on our Club 3D Radeon X800XL and roughly the same as the cooler on our XFX GeForce 6800 GT. 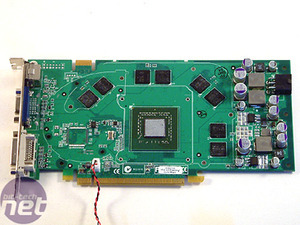 The PCB closely resembles the GeForce 7800 GT's PCB, with some subtle differences in the power circuitry at the end of the card. The similarities become even more obvious when the video card is turned over. There are eight 32MB Samsung 2.0ns GDDR3 memory modules on the card clocked at 1000MHz, making a total of 256MB frame buffer on a 256-bit memory interface. The GS uses the 110 nanometre NV42 core, and our reference card operates at 425MHz. GeForce 6800 GS is an SLI ready video card, so it is possible to a second card a little later on for improved gaming performance. However, if you are looking to buy two cards today, you might be better looking at something along the lines of GeForce 7800 GT or Radeon X1800XL. 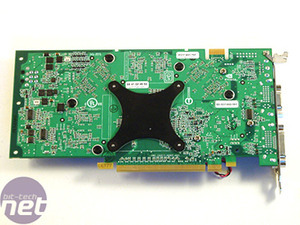 The reference card's back plate features one DVI port and an analogue 15-pin D-Sub VGA port, along with a HDTV-Out port on the left. This is rather unfamiliar, as all of NVIDIA's GeForce 6-series PCI-Express based reference cards above GeForce 6600 GT have featured dual DVI outputs. We understand that the choice of outputs will be down to the individual board partners, so we may see some opting for dual DVI over the combination that's on the reference card.